In his book, Colour and Culture, practice and meaning from antiquity to abstraction, John Gage brings to light that the Greek words for purple seem to have had a double connotation of movement and of change. This could be accounted for, he explains, both by the many colour changes involved in the dyeing process and by how its lustre reflected back the light of the universe lifting this colour somewhere between the secular and the sacred (p.25). These past months have been, and continue to be, a period of movement and of change for my children and I. The transformation we are enduring is perhaps not visible but certainly it is deep and strong and holds the potential for beauty and lustre too. Pain makes us grow, does it not? Tristan's music, Héloïse's love of theatre and my need to create bring us moments of shared joy, as do our wonderful friends, of course. 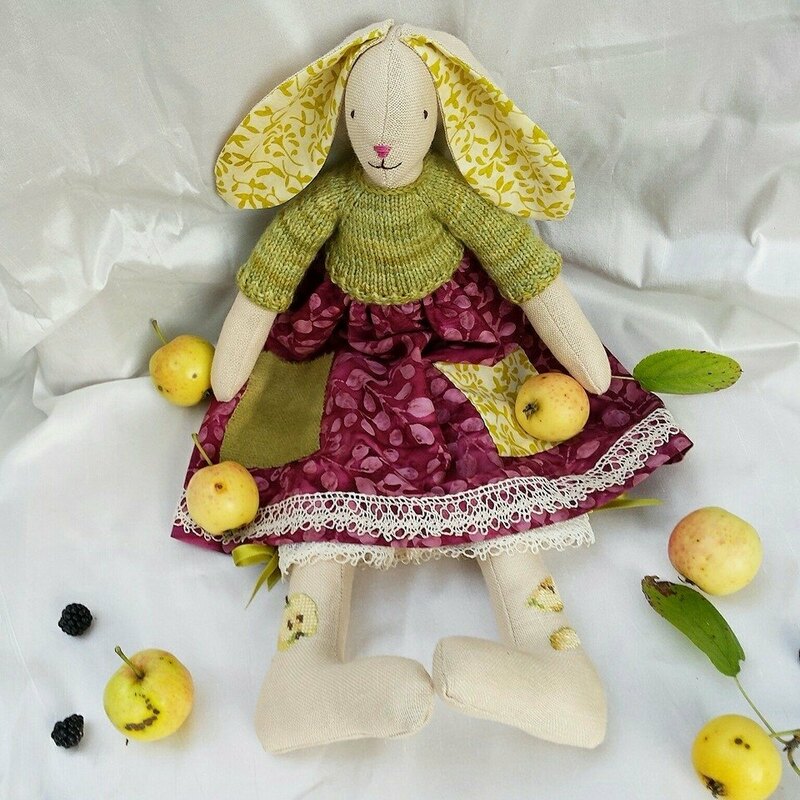 I have been beavering away at mice, rabbits and kittens for Christmas markets and orders and feel excited about facing new creative challenges and projects in the new year. I am holding onto this blog by the skin of my teeth; confidence in my voice is lacking and I feel almost embarrassed about how unoriginal I have become but whilst I write these awkward words I am chuckling at myself. I have faith that time will bring clarity to myself and to Héloïse, Tristan and Angélique. In the meantime I admire my children for striving forth every day and remaining full of integrity. I am so sorry this post is a meagre one but I simply wanted to reach out to you all. 2015 has been a horrendous year in so many ways but when I look back the good that has come out of the past twelve months by far outweighs the pain. I hope you all have the peace and joy you deserve over Christmas and I look forward to sharing the new, hopeful year with you. 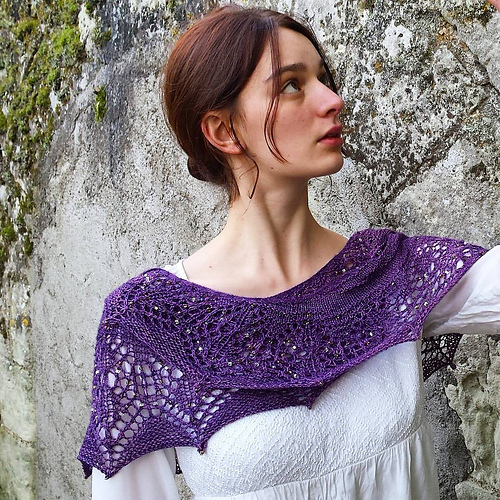 The Ravelry notes for this purple shawl, made for a dear friend a few weeks ago, are here. Dear Stephanie, 2015 was not a year for you. But you and your beautiful children will bounce back in 2016 and make the year full of good memories and lots of love. I love all your creativity and I'm sure you will have more to show us. Merry Christmas, dear lady. Strong,beautiful words and the lovely purple shawl matches them. Your words always resonate a tremendous truth and I thank you for that. There is positiveness that comes from pain, even if it takes ages to realize it. You are much stronger than you were a year ago, six months ago and even last week. You are strong and capable and a fabulous Mother, showing your children how to work through all of this mess. I wish you a peaceful Holiday and I wish for you that 2016 is a year that sees you shine. Time and a hopeful mindset is the best healer and I think you have that.. and are a shining example for your children. I know your crafting and knitting bring you peace and happiness so I'm glad to see you carrying on with it. What a beautiful shawl and magnificent color! Please don't feel bad about your blog, your words and images are a constant inspiration to us all. I hope that the New year brings you great happiness and joy. Unoriginal never Stephanie ... I cannot associate that word with you! I also fight to keep my blog going and I will but as ever it is a fight for time. Holding down three jobs is no joke! It will pass I keep telling myself and so will your troubles and as you say we grown when there is strife in our life which will make us stronger. I detect such courage and positivity in your words which really heartens me to hear. So wonderful to hear how the children are doing as well. I remember last Christmas for both of us. Just random comments back and forth on IG about the season and knitting, followed by our birthdays and then the news of Vanessa, shortly followed by my world and then yours tumbling. Look at us now striving forwards for our children. We haven't spoken for a while properly so I don't know all the details of what you're coping with behind the scenes but I do know you're moving forwards with strength. Well done beautiful brave lady. Keep writing and creating! we love you? I don't put messages very often! not enough time. Pascale, une francaise en Angleterre. I admire how you have coped with everything 2015 has thrown at you Stephanie with courage and dignity. Wishing you and your lovely family a very peaceful and joyful Christmas and a much happier time in 2016! MAy 2016 bring you everything you need. I wish you and yours a very happy Christmas. 2016 will bring its own changes, and they are bound to bring a measure of satisfactions.....and joy. In the meantime, it is so good to know that you'll post as you can. Your voice isn't lost - I hear it in this piece. Wishing your and your children a wonderful Christmas time! Hope the New Year will bring Happiness, Love and Peace to you all! Wishing you and the children much joy for this holiday season. May peace and tranquility find you in the New Year. Lovely to hear from you. The shawl is beautiful and so is the model. Refreshing to see a young person (especially a woman!) not all 'tatted up' (tatoo)and disfiguring her beautiful skin. You are emerging from that dark tunnel a stronger person... have a blessed Christmas. I have missed reading your wonderful posts, but have kept up with Facebook reading. I have survived my major spine operation and feel so well and strong now. 2016 looks vey hopeful for us both! I do wish you and the children a happy Christmas together as we celebrate the birth of Jesus at Christmas. This post is far from meager, Stephanie. It is eloquent and truthful. You may still have shaky legs after the hell of 2015 but you are a warrior, setting a strong example for your children. Your daughter is beautifully grown up here in that lovely shawl. I love her name and how it's spelled. Hugs to you darling. Merry Christmas to you and your family dearest Stephanie! How nice to hear from you, Angélique, Tristan and Héloise. I've been thinking of you often this year. And hope, things will turn well for you. Héloïse is more beautiful than ever, clad in white with your magical shawl. Your words are never unoriginal, and always dear to me. Have a wonderful Christmas, dear Stephanie. I cannot begin to find any words to fill in the gaps of time that have widened between us; I emailed you a while back, but I knew you were far too busy to respond. I am no longer blogging per say, but do want to keep connected to those women who have inspired me so...you one of them. It is all life isn't it, the pain as well as the joy. You seem to me to have handled your so difficult year with much strength and wisdom. Here's to an easier 2016 to you and yours. A lovely post Stephanie. It's a new year -- full of hope and promise and I know it will send beautiful new treasures your way. Looking forward to seeing your beautiful bunnies and projects. Happy New Year! I hope that the new year will bring you peace and measures of joy while you heal, Stephanie. Hello Stephanie I'm a new follower! You have an amazing blog. You have wise words. Your shawl is beautiful. I'm happy to found you. Wishing you a better Year full of creativity, good health, joy and peace! Your blog is wonderful to read, please post again soon. Fantastic work, thank you so much for shedding a light on the topic. Hello, your blog too! I come every day and I like it a lot !!! Un blog sympa que je découvre seulement ! I hope this finds you and yours doing well. May we display your header on our new site directory? As it is now, the site title (linked back to your home page) is listed, and we think displaying the header will attract more attention. In any event, we hope you will come by and see what is going on at SiteHoundSniffs.com. C'est interessant de trouver comme ce genre de postes. Thinking of you and, as always, miss your lovely posts. I hope life is getting on track again for you and that you and your family will have a wonderful Christmas. Vraiment très intéressant. Bonne continuation à vous ! Grâce à vous, j'ai pu apprendre beaucoup de choses intéressantes. J'espère en apprendre encore. Heureuse d'être parmi vous et découvrir vos postes. J’espère que vous partagez d'autres notes. Continuez ainsi. Tu es incroyable, mille bisous pour toi. Writing up my Phd on Baroque Garden Design and living among the horticultural delights of the Loire Valley have woven their magic upon me. My quest is to incorporate gardening in virtually everything I write and make. I am a teacher and translator too. I love my husband, three children, Baroque music, knitting, sewing, tea, coffee, and cake making.... not necessarily in that order! All images and text on this blog are the sole property of Stephanie Boudazin and may not be used, copied or transmitted without my express consent. Thank you. Copyright. © Stephanie Boudazin. sbmillefeuilles. 2011-12. All Rights Reserved.. Simple theme. Powered by Blogger.